Meet B-Unstoppable and if you’re thinking the name is just a fancy name, think again! B-Unstoppable is a flying drone capable of doubling up as a tank as well. 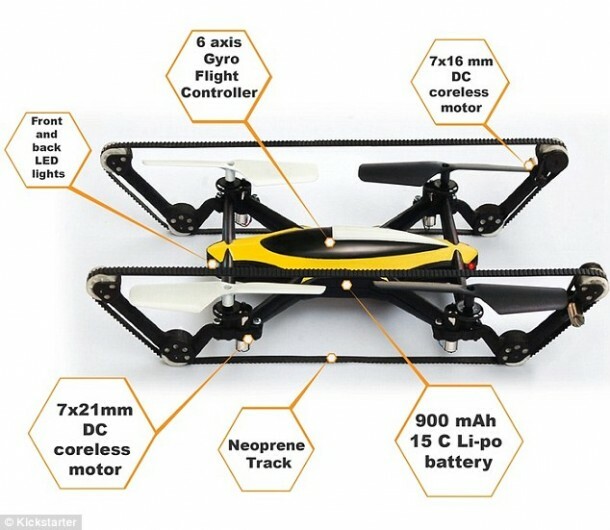 It has been termed as world’s first ‘hybrid tank quadcopter’. It features four propellers that allow it to fly and also sports two caterpillar tracks which allow it to tackle a variety of terrains on the ground. It has been built by Witold Mielniczek from London. As of now, he is seeking funding from Kickstarter to raise $76,000 so that he can fund the production. Right now, you can get a unit by pledging $85, however, this price will soon be going up. The vehicle is capable of turning on the spot on the ground and upon encountering obstacles that are too big for it, ‘it can simply take-off and fly over’ Mr. Mielniczek explains. It weighs only 84 grams and this minute weight implies that the vehicle is light enough for the drone to survive crashing into the ground. 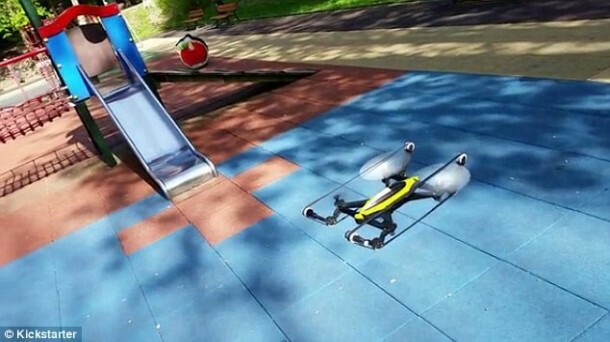 The drone that also features a camera can fly for a total of 9 minutes on a single charge of battery and can be driven for 18 minutes. For combined activity, it can run for 15 minutes. It has lights on the front and back that render it capable of being flown at night. Mr. Meilniczek stated that it is quite easy to control and a button the remote controller can transform the vehicle from tank to drone and back. He further added, “On the ground each track is controlled by a separate channel so you get the full experience of driving a tank.” Arms are used for maintaining the tension in tracks. These arms can flex by 2-4 millimeters. The vehicle also has a six-axis gyro flight controller incorporated on board which keeps the vehicle stable when it’s in air. If all goes well, shipping will begin in October, 2015.